November fourteenth was the last day a deceased donor could be found for Alexander. That moment went by quickly, as they started preparing me for operation at six o'clock in the morning. The nurse came to wake me a little before six, so I could still prepare myself, for instance, by take a shower. She gave me a lovely blue operation suit to wear. After a quick goodbye it was time to drive off to operation theatre 20. As the first shift hadn’t started yet, we bypassed the holding area  and went straight to the operation room. A bright room, filled with lots of cool equipment and a few friendly people. Suited up and ready to go. The anaesthesiologists helped me get from my bed onto a little plank: the operating table. Clearly not made for my comfort but to allow unrestricted access to all the specialists involved. Also, simply, because they needed to be able to get a X-Ray machine close to me. 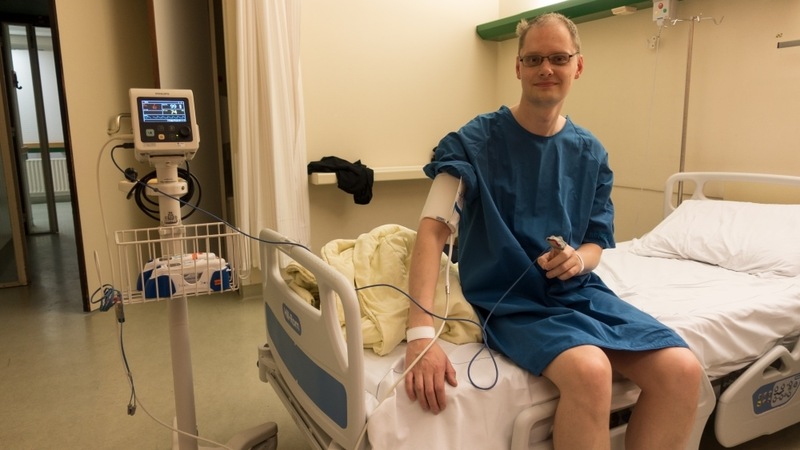 After the IV’s  were put in my arms and heart monitoring was hooked up, the anaesthesiologist proceeded to try to get the epidural line in. The epidural line is put in the back and blocks pain in the lower body. The line would stay for a few days, to allow for regulated pain relief during recovery. This didn’t go as smooths as we liked. The first two attempts didn’t go in between the vertebrae, and were very painful. In the end they let me lie down on my side. This worked better. The line went in. I was helped on my back and got an oxygen mask on my face. This was the start of the time-out procedure. After saying good morning to the surgeon I quickly lost consciousness. The next step was intubation; I needed oxygen. They put the breathing tube straight down my throat. Also, another few lines were added to my collection: two arterial lines, one in the hand, and one in the neck. These thick lines connect directly to main arteries, allowing for quick absorption of medicine. Because my bladder would stop working because of the epidural, I needed a uretic catheter as well. Google that and cringe. I’m glad I was already unconscious. The plumbing and electrics were in place, time for the main act. The surgery began with a straight cut from the bottom of my rib cage to my belly button. Cutting through a the layers, they had to expose my liver. The liver was mostly hiding under my rib cage. Some force was required to push the ribs apart and create some working space. Around nine o’clock the surgeon had inspected all sides of the parts of the liver and declared them suitable for transplantation. They contacted Alexander’s operation room and told them to start preparing him. They would start roughly the same preparation as with me, and would start opening him up as well. They cut along the cut of his Kasai operation, and widened that even a little bit. The next step in my operation room was to remove my gallbladder. They don’t want any excess bile spraying all over the place, and it is in the way during the procedure. Snip and it was gone. 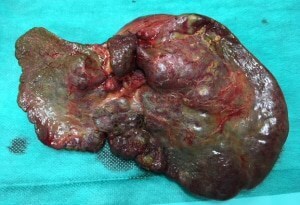 Then they mapped the biliary tree with contrast fluid in the liver segments they were going to cut. This made sure they would cut as few as the biliary ducts as necessary to avoid leakages. Clips and X-ray images helped to map them. Then an ingenious device was used to vibrate away the liver tissue, instead of cutting it. This way the biliary ducts and blood vessels would be untouched until absolutely necessary. At 14:43 they finished this process, and signalled to the other operation room that they were ready for transfer. Alexander’s preparations were long finished by then, and they were basically waiting for us. It took the surgeon four minutes to cut all the blood vessels and bile ducts. My liver’s sections two and three were put in plastic, and fluids were pumped through them to clean them of residual blood. 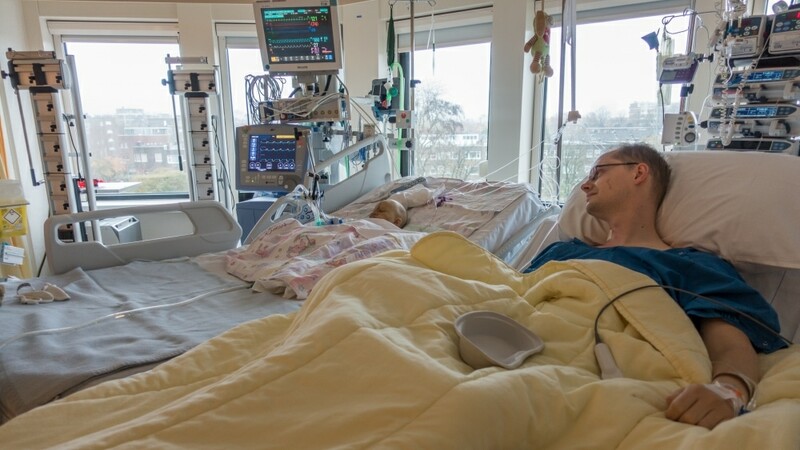 After a thorough inspection on the back table, the 280 gram liver was then quickly transported next door, where the surgeons had already taken out Alexander’s old liver. My surgeon continued to clean me up, made sure there were no leakages , and put a drain into my belly, just in case. The drain would stay in a few days, and was basically a plastic tube connected to my stomach cavity. If any fluids would drip down they would be taken away by the drain. Also, they took one of my lesser used arteries  out, so they would have spare parts in case Alexander would develop complications. They then had a easy strong peace of artery to fashion a new connection. A thick suture  was then used to zip me up inside, and my outer skin was pulled together with some thin self absorbing wire. At 15:00 my operation was finished. I had only lost 100 ml of blood during the whole procedure. I was moved to Intensive Care as I started to wake up. I was extremely tired, but very happy to see Zuzana again. The operation had lasted a little more than eight hours. We still had to wait quite a while to hear from Alexander. I drifted in and out of sleep for the next day until they moved me to the ward. For Alexander there was still a lot of work to be done. 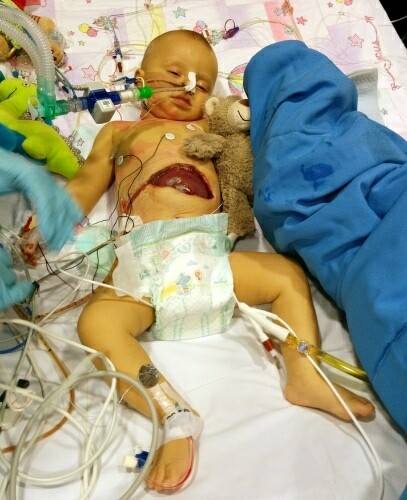 His old liver was taken out, the new one had to be placed. The connection between his intestines and the old liver needed to be cut and put back in place in the new one. This was a very tricky process. The main arteries leading to the liver were sewn together by the surgeon. For the smaller blood vessels and bile ducts they called in a plastic surgeon. He used a powerful microscope and very steady hands to sew them together too. The procedure went by the book. Alexander developed no complications during surgery, and eight hours later they were done. The team always made three echo’s  to make sure everything is doing what it’s supposed to be doing. He did loose 400 ml of blood, half of that was still in his old liver. Alexander on Intensive Care. His belly is still open, and the liver clearly visible. 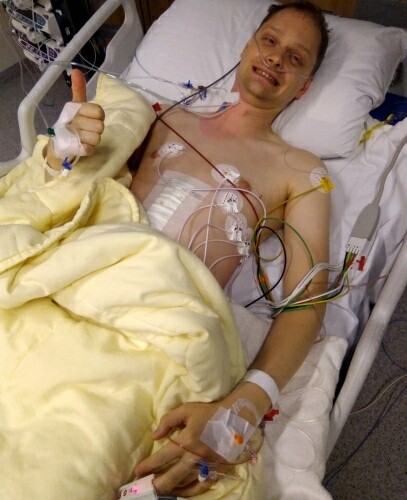 Me, just arrived on Intensive care after 8 hours of surgery. Because my liver was a little bit to big for Alexander, they had to leave his cut open. Forcing it closed would have almost certainly damaged the sutures  on the blood veins. The wound was covered in plastic, so the risk of infection would be minimal. A few days later it would be safe and healed enough to close him up. Me visiting Alexander on my way to the ward. Alexander was done after eight hours of surgery, at 17:50. He would spend the next week in Intensive Care.